To escape the wind pounding Chicken Ridge, we drive to the North Douglas trailhead. The microclimate here can feature tree-toppling winds but today it is calm. Without wind there is little drama in the forest we pass through to reach the beach. Aki stops once to stare into the old growth forest and I think, “deer,” but see only a scene painted in the dull pallet of a winter thaw. I hear eagle complaints but none circles the water over fish when we break out of the trees. Only a common merganser rides some small swells before flying away. “Aki, where is the straw to stir the drink?” The little dog, who cares little for baseball, doesn’t know that Reggie Jackson used that phrase to describe his ability to make a difference in a game. She does love a garnishment of cheese in her kibble so I change metaphors. “Where’s the cheese?” Aki perks up at the mention of her favorite treat but is soon back to nosing the tide line. 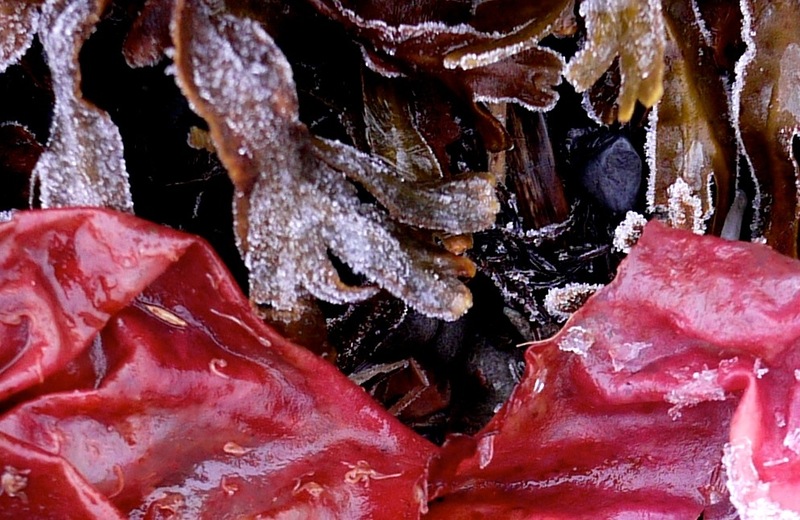 She passes up a magenta patch of seaweed, a bright island in a sea of frosted rockweed. I do too. Back in the woods, we hear an almost rhythmic rapping like you would expect from a student drummer. I doubt if it’s from a red-breasted sapsucker. Their tree assaults have a jackhammer tempo. 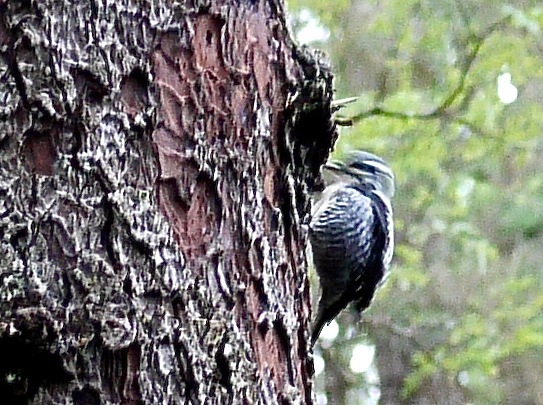 It’s a downy woodpecker, rapping away on a spruce. Aki walks down the trail but I move closer. The bird ignores both of us but continues to add audio spice to the gray day. This entry was posted in Aki, Dan Branch, Downy Woodpecker, Juneau, Kwethluk, Nature, Southeast Alaska on December 18, 2014 by Dan Branch.